ATLANTA, Georgia (CNN) -- The Federal Aviation Administration is investigating how an international flight into Atlanta's major airport landed on a taxiway instead of a runway early Monday. The pilots of the plane that landed at the Atlanta airport have been relieved from flying duties pending probes. FAA spokeswoman Kathleen Bergen said Delta Flight 60, from Rio de Janeiro, Brazil, to Atlanta's Hartsfield-Jackson International Airport, was cleared to land about 6:05 a.m. Monday on Runway 27R but landed instead on Taxiway M, which runs parallel to the runway. The flight had 194 passengers and crew aboard, according to CNN affiliate WXIA. No other aircraft were on the taxiway, and there was no damage to either the taxiway or the plane, a Boeing 767, Bergen said. A runway or taxiway collision, particularly with one plane preparing to take off and carrying a full fuel load, would be catastrophic. Bergen said she isn't sure whether or when other aircraft have ever landed on the taxiway at Hartsfield. Both Runway 27R and Taxiway M are 11,890 feet long, Bergen said, but the runway is marked with white lights while the taxiway is marked with blue lights. Delta spokesman Anthony Black said the airline is cooperating with the FAA and the National Transportation Safety Board in their investigation, as well as conducting an internal investigation. The pilots of the flight have been relieved from active flying pending the completion of these investigations, Black said. Bergen and Black said a medical emergency was reported on the plane, but neither offered any details. The incursion came just two weeks after the FAA announced that serious runway incursions were down 50 percent from the year that ended September 30, 2008, over the year ending on the same date this year. The FAA said there were 12 serious incursions in 2009 and 25 in 2008. Only two of the serious incursions involved commercial airliners in 2009, compared with nine in 2008. The FAA defines a serious incursion as one in which a collision is narrowly avoided, or there was a significant potential for collision that resulted in the need to take quick corrective action. 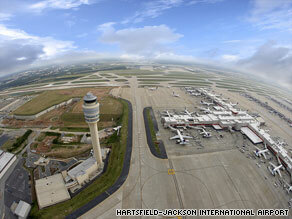 All About Hartsfield-Jackson Atlanta International Airport • Federal Aviation Administration • Delta Air Lines Inc.